This was easy to make and a nice alternative to overnight oats or homemade granola. Sweet enough from the dried fruit and spices to eat with no additional sugar. A bit too much anise for my personal taste but that's easily corrected. The recommended serving size made a healthy, satisfying breakfast, and my kids liked it! A good basic recipe and I am looking forward to testing out variations with different fruits and nuts (she recommends a few in the notes). Wasn't a fan of this. I threw away the mix simply because I didn't like the flavors, though they sound good on paper. Also, the taste of untoasted oats is gross, I'm done with muesli I think. I'll stick to my granola. I omitted the sugar, I can't imagine including it or it would be way too sweet for me. Puffed Kamut was the only unsweetened puffed whole grain cereal I could find. I had a bit of a problem with them crumbling; however, I found that pressing them down with wax paper and then refrigerating them kept them together. Good! If making this in the morning, it would speed things up to have cherries (if using fresh), lemon zest and dried apricots prepared. The recipe calls for letting it sit for 30min after baking, then cutting into bars, then letting sit for another hour, but we ate them after the initial 30min and they were good warm; in my opinion there's no need to let them sit for another hour. I'd love to try this with raspberries. These were a hit at brunch; excellent flavor. I'd make them even smaller - 24 mini-mini scones. This cake was disappointing. The result was not worth all the work. It was dry and the texture was unappealing. I think it needed more fat. The spice flavor was overwhelming and left my mouth with an unpleasant aftertaste. Who would have thought that dropping your prepared dough into a bowl of cold water to prove! I really didn't expect this to work particularly because I forgot to add the sugar but hey presto after 30 mins in the cold water the dough rose to the top - amazing. The bread was lovely too- don't expect a light 'commercial' crumb - but as I only eat whole grains I'm used to this. It is delicious and very quick to make - just follow the instructions to the letter and you'll have bread in under 1.5 hours. It toasts well and 3 days on is still lovely and fresh. I keep my bread in a crock in a cloth bag. Additional comment - just made this again, and timed myself. From total start to finish (including weighing out ingredients) it took me 1 hour 25 mins for a finished loaf. A very wet dough, way too much water for my flour. I'd recommend holding back about 1/4 of the water since no knead doughs tend to get slacker as they ferment. My rising time was longer than stated in the recipe. An interesting taste, not a lot of rise, but a pleasant bread overall. Probably won't make this again however. I have made this in the past, I think I found it good-not-great, but unfortunately I don't remember much else about the recipe. Made this for a Memorial Day cookout, and it was everyone's favorite salad. To be honest, my husband picked the recipe- the combination of ingredients initially did not sound appealing (tarragon, celery, lemon, figs, apples, along with the barley). However, the flavors really did sing together, though you will need to tweak for the correct balance between sweet and sour, and the tarragon wasn't too overpowering. I did make this ahead but didn't add the herbs or apples until just before serving. This salad is more carrots than kamut (I actually used hard wheat berries) but it is very refreshing. The dressing with lemon and orange juices and cinnamon added lovely flavors. The golden raisins and pomegranate seeds further reinforced the Middle Eastern notes - this would be a lovely salad with any Middle Eastern grilled meats or chicken. It looks very pretty too - the author suggests it as a holiday side. I wouldn't repeat this. While it isn't difficult, it's time-consuming (shredding the carrots, toasting and chopping the walnuts, dissecting the pomegranate, etc.) for little flavor. The Kamut took 80 minutes to cook, despite the overnight soaking. This is incredibly easy and lifts bulgur into something very special. Browned butter and toasted almonds add a delicious nutty aroma and taste and the cinnamon and cayenne a hint of spice and heat. Pg. 90. This is the first recipe I've made from this book and we're off to a good start. This made a lovely accompaniment to herb-marinated grilled lamb. I made the variation which uses toasted pine nuts instead of sesame seeds and fresh basil instead of dill. It was simple to prepare and we really enjoyed it. It was even better today for lunch. Another bonus: I am not really a fan of zucchini, so I was happy to note that the shredded zucchini more or less disappeared, with the result that we got the nutritional benefits and the moisture added, without having to taste it! Excellent side dish. Went well with grilled salmon. Used half regular quinoa and half red quinoa. The recipe ingredients are set up oddly, with the beets listed with the sauce ingredients, though they go in the quinoa. Also, too much liquid is called for. It needs to be cut back. Pg. 111. This made a beautiful, bright orange soup made with kabocha squash. That was the only change I made to the recipe. I liked it, but I didn't love it. The spicy yogurt definitely made it better. I felt that the oatmeal made the soup too thick and I would simply eliminate that the next time -- of course, that would also eliminate the 'ancient grain' aspect of the recipe. I just think it would have both a better texture and taste without the oatmeal. I thought the amount of heat provided by the pepper flakes and cayenne was just right. I have learned that I am a fan of soups that have a final dollop or topping. This one did not disappoint. The soup came together quickly and had good flavor though next time I'll consider adding a little more garlic and letting the onions brown just a bit to push it a little further. I liked the level of heat from the pepper flakes and then the cayenne, but I can imagine that others might through a hot pepper into the mix with good results. I did use the fat free greek yogurt and didn't feel like I was missing out. Delicious lamb and wheat berry stew! Next time I would add a bit more lamb and a few fewer carrots, but that's just personal preference. We both loved it. There are so many of my favorites in the ingredient list that I really wanted to like this. Based on MM107 and LauraW, I skipped the sugar all together and I subbed dried apricots because I don't like raisins. I'm not a huge fan of fruits in savory dishes and I wish I would have followed my instinct and left the apricots out. But, what was really off for me was the cinnamon. I will definitely switch it out next time, maybe thyme or basil.Everything else was delicious, including the roasted shrimp I added the second day. This sauce was even better the next day after being refrigerated and the flavors had more of a chance to meld. While Maria Speck advises letting the sauce have between 30 minutes and two hours to come together at room temperature, my husband found the sauce too acidic, and I didn't think the flavors were well integrated after more than an hour--the anchovies were much more pronounced the first day than after the remaining sauce spent a day in the refrigerator. This was a nice pasta dish for the olive lover. O loved it but E pronounced it "yucky" - I think she doesn't like herbs these days. T complained about whole wheat pasta which he doesn't like. I'm not a huge fan either but IMO it went well with the gutsy flavors of this dish. The proportions of pasta to sauce were perfect. I did add a bit of extra salt to the dish and that was a mistake; once I added some parmesan it was a little too salty. Tasty. Added blue cheese which made it zing. Substituted instant polenta for regular polenta, and jarred artichoke hearts for frozen ones. Loved the crust, but did not care for the artichkoes in the filling. Will try again with porcini mushrooms instead. The recipe makes for a very healthy (no sugar & fat) delicious wholegrain snack. The fruits add a lovely tang and the rye flour and hazelnuts make it chewy and crunchy too. I didn't soak my fruit for several hours as per the recipe I just brought them to a simmer in a small pan for a couple of minutes and cooled them quickly, this worked fine. ...this is the most joyful book about whole-grain cookery we've seen... She's not promoting a 100-percent-whole-grain diet, but the recipes make it possible to eat more grains, deliciously. Speck knows that the health benefits of whole grains will never overrule our desire for delicious food and...provide a collection of recipes that are delicious and also happen to contain whole grains. After paging through this beautiful, inspiring cookbook - a love story to whole grains - you’ll feel empowered and excited to dive into the world of whole grain cooking. This was a great way to start the day. The chewy, sweet figs were delicious with the tangy goat cheese filling. ...These muffins will undoubtedly make repeat appearances. ...deliciously creamy dessert references familiar dishes like rice pudding and coeur a la creme but manages to also maintain a unique identity. It is fresh, creamy, lemony, and perfect for spring. Food writer Maria Speck’s passion for propelling Old World staples such as farro, barley, polenta, and wheat berries to the forefront of new American cooking is beautifully presented in Ancient Grains for Modern Meals. In this inspired and highly personal book, Maria Speck draws on food traditions from across the Mediterranean and northern Europe to reveal how versatile, satisfying, flavorful, and sophisticated whole grains can be. 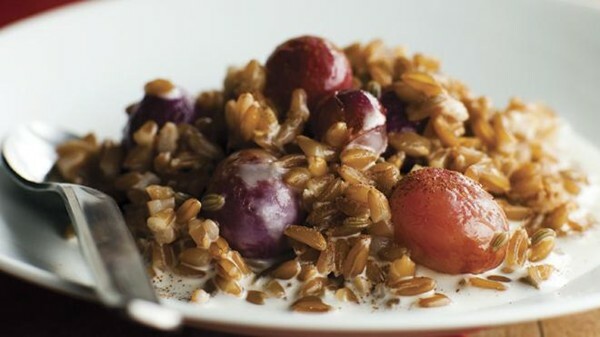 Rustic but elegant dishes--Creamy Farro with Honey-Roasted Grapes, Barley Salad with Figs and Tarragon-Lemon Dressing, Lamb Stew with Wheat Berries in Red Wine Sauce, and Purple Rice Pudding with Rose Water Dates--are sure to please discerning palates and become favorites in any whole grain repertoire. Food lovers and health-conscious home chefs alike learn how to integrate whole grains into their busy lives, from quick-cooking quinoa and buckwheat to the slower varieties such as spelt and kamut. 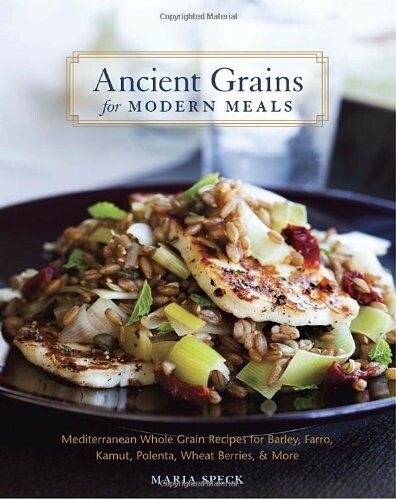 The stunning flavors and lively textures of whole grains are enhanced with natural ingredients such as butter, cream, and prosciutto--in moderation--to create lush Mediterranean-inspired recipes. Maria’s approachable style and generous spirit make this collection of time-honored, updated classics a treasury for today’s cooks. 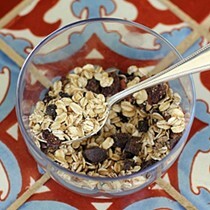 Maria Speck and her Ancient Grains for Modern Meals from GoodFoodRevolution on Vimeo.